What if we are reading the bible in the wrong direction? I had this weird thought the other day when I saw a “timeline” of the bible in a classroom. We sort of read the bible from genesis to revelation like we would read any other history book but shouldn't we start with the cross and read our way out from there. Now I know that’s awkward, because our brain is trained to read and understand things in a time line but Jesus is really the central part of all creation. He was plan ‘A’ all along. We have the advantage of knowing the focal point. I have sort of a picture of a drop of water falling into a bucket of water. 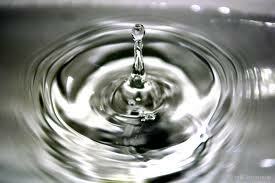 The ripples reverberate out in every direction from the drop. What if we told people about Jesus in that direction? What if we actually had that in mind when we live out and share our faith? As someone who is supposed to be teaching youth and children about what it means to be a Christian it sometimes seems like we start with stories about Noah, David, Elijah, a talking donkey, etc. We have this idea that if we teach them all the bible stories and tell them all the rules that we should live by and what it means to be a good and moral person then somewhere along the way they will eventually get a glimpse of Jesus and be saved. Am I the only one who thinks that a little off? I mean we know that does not work, it did not work for anyone in the bible. That is why Jesus had to come. Now please don’t get me wrong, of course we need to be teaching kids morals, discipline and boundaries, but why not teach them why we should be like that, because Jesus died for us wants us to be like Him. I think the power of the cross, the power of the spirit Jesus sent after he came off the cross, to empower us, to live for us is what we should be starting with. Otherwise we are just setting our kids up to fail, trust me they are going to fail at some point. We do not need to set them up for it. But if we know that God loves us, because the bible tells us so, why don’t we teach people that. I mean we sing the song, and then we say, “to be a Christian you have to live by these rules”, when Jesus said, Love God and Love your neighbor, all the other rules fall under those two categories. (paraphrased) Please don’t follow the rules and morals and ways of living thinking that if you do that God will love you. God already loves you. Let that mold how you live your life. And I do not think this is just for kids, it’s for all of us. Jesus said if we don’t have faith like little children we’d never see the kingdom. Then we jump in and throw the human two cents in, over complicate things and mess it all up, again. If we don’t start with the single thing that brings us back to God, the single thing that shouts out his love for us, we will never know God loves us. If you’re one of those people that are shouting at people that they are sinners and they have to repent but you are not telling people that God loves them, then you are a whack job making noise –and I mean that in the most loving way possible and Jesus loves you too (the bible would say you are a clanging cymbal). But if you are just out telling everyone that God loves you and not letting anyone know that he sent his son to die for their sin and yours, then you are not loving that person either. The reason he had to come is because of our sin, not for kicks and giggles. If we can see things from the centre – and Jesus is the centre, everything starts with him and goes out in all directions to the Father who surrounds and encompasses everything with his love – maybe we can start to understand the rest of the things in the bible, all the plagues and wars God allowed, all the pain and suffering, all the messed up lives, all the people who actually did the things he asked of them, all the law and prophets and covenants and sacrifices made for Him and by Him. God gave us the example of how huge his love really is for us when he sent Jesus to pay for our sin. Every word of the bible has to be seen through the perspective of that event, how that event fulfills everything that happened before and after. So in case no one has ever told you, God absolutely loves you, no matter what, he loves you. So he sent his Son Jesus to tell us to turn from the world and turn to God, then because there was no other way for us to actually get to God, Jesus was killed on the cross to be a sacrifice for everyone who asks and believes that he has forgiven them, turned from their sin and accepted Jesus as the only way to come to God. Now, if you believe that and have asked for it – and this is the crazy weird part – Jesus actually comes and lives in you as the Holy Spirit and helps you to know God’s love and follow the things he told us to do if the first place, the things your Sunday school teacher, bless her heart, told you you had to follow so you’d be acceptable to God. Guess what, that’s the only way you can do it and #2 you’re never going to do it perfectly, so stop beating yourself up. You can stop handing your kids or your friends a bucket full of rocks and mud and dirty water to carry around to try to build their life with. If you’re going to give someone a bucket make sure you start with dropping Jesus in centre of everything you do and say. One drop from him can clear it all up, no matter how dirty it seems. One drop of his living water can make it all make sense. John 4:10 says, ‘You do not know the gift of God. You do not know who asks you for water. If you did, you could ask me. I would give you living water’. We will not find living water in any other place than Jesus himself, if you don’t start from the center, how will you know who you are asking? How will you know that the gift he is offering is eternal? How will you have faith?